Having considered the offerings at the multiplex, we decided to stay in Thursday night and watch a movie. Frozen, maybe. About time, since friends of mine wrote the songs and I still haven’t seen it. We go to the theatre a lot. Plays, musicals, whatever: over 50 shows so far this year. But somehow we haven’t been to a movie theatre in 2014, and the only video we made it all the way through in one sitting last year was When Harry Met Sally. Well, of course we could. But we had eggs and grits for brunch, and corn chips as a snack; not to be corny about it, but maybe that’s a little too much corn? (There seemed a kernel of truth there, but that’s the last pun on the subject.) And besides, we’ve got CSA eggplant that we don’t want to waste. Okay, why not? I’ve never made it, but it’s good to prove that I can follow recipes, too. I’d make the eggplant, she’d start setting up brine to pickle the cucumbers we brought home last weekend. I headed for the market. There was some very fine eggplant. There are pickles that, I’m sure, when we open the first jar in three weeks’ time, will be amazingly fresh and dill-icious. (I didn’t promise no more puns, just no more about corn.) There was no movie. By the time the last jar was sealed and the eggplant came out of the oven, it was too late to start. And if there had been a film crew doing a documentary while we worked, it probably would have been titled In a Kitchen This Big You’d Think They Wouldn’t Trip Over Each Other So Much. Another night, the same movie still unwatched. Story of my (contented, well-fed) life. 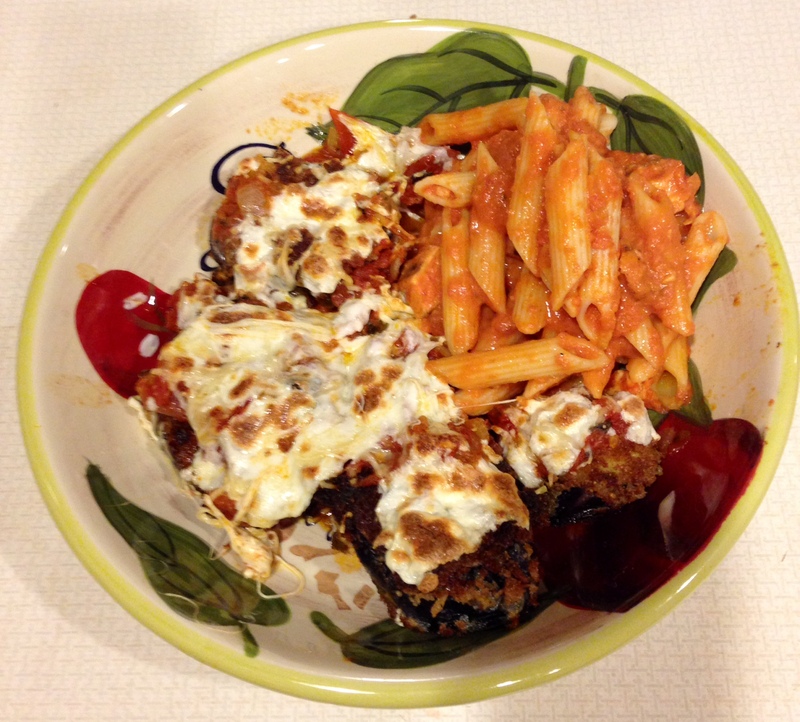 Eggplant parm, served with a little leftover penne-from-the-barbecue-place. Hey, at least dinner did not consist solely of Monkey Bread.